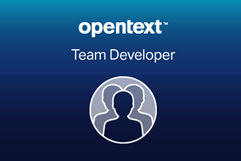 using OpenText Gupta Team Developer SQLWindows environment. Feel free to browse and participate in creating your own articles. Please help if you like to get this going. Mail me if you have any questions. Team Developer Q & A forum. For the community, by the community !! Team Developer, SQLBase, Report Builder, TD Mobile and other related tools. Connect to the community. Free registration, no OpenText GLS required. This page was last modified on 18 January 2019, at 15:48. This page has been accessed 647,811 times.